I found that most people don’t really know how to properly plan their site. 1. How will you get people to your website? More specifically, what marketing techniques will you be using to attract your target audience? Is it search engine optimization? Pay-per-click advertising? Social media? PR? This step is very important, as it often answers many of the questions below. Tip: Calculate which marketing technique works best for your site, by figuring out which has the lowest cost-per-acquisition (how much you spent on getting a customer). 2. Who will be coming to the site? Your website needs to take all kinds of visitors by the hand and help them find what they are looking for. Within a few seconds of getting to your site, a visitor needs to know what to do next. Do they need to sign up? Should they click a link to learn more? Once you determine what visitors are coming, you’ll be able to determine what they need to do once they get there. Tip: Don’t try to please everyone, but have your site clearly laid out to direct visitors wherever they need to go. 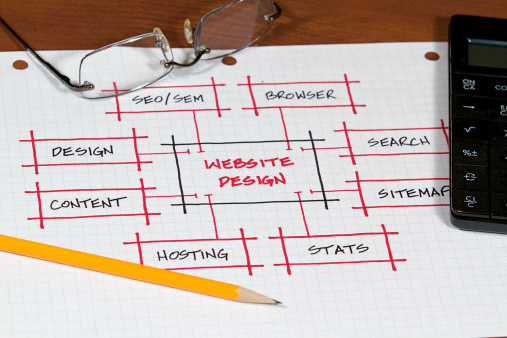 If you do too much your website will become busy and difficult to navigate. Focus on a few key features that majority of your visitors will benefit from. 3. What questions will my visitors have? Am I at the right place? How long have you been in business? Can I afford you? How do I know your product or service is any good? How can I learn more about your services and company? How do I contact you? Tip: Try to answer the questions before they are asked. For example, if your visitors come to purchase a specific product that you’re well-known for in the industry, have that product easily located so they know they’re in the right place and can access product details right away. Clear, short messages work great. 4. What do you want your visitors to do? Should they pick up the phone and call you? E-mail? Sign up for something? Buy your product online? A great website will guide your traffic where you want them to end up. If you’re selling a product, convince the visitors to buy and make it easy for them to do so. If you offer a service, let them know how and why they can benefit from it. Tip: Be clear and concise. Don’t make visitors think. 5. How do my visitors like to stay in touch? Keep in mind, that most people who come to your website won’t become a customer. In fact, the average conversion rate on the Internet is around one percent, meaning only 1 out of 100 visitors will end up contacting you, signing up, or buying something. Find out what forms of communication your visitors prefer and give them the means to stay connected: e-mail, a blog, Twitter, Facebook, LinkedIn, Google, RSS Feeds, and more. Tip: Engaging your customers is important, as most people don’t convert on the first visit. Keep them coming back by identifying your target visitor and catering to the market that best reaches them. If they’re entry-level professionals and they’re constantly engaging in social media, have a social media presence and actively provide them reasons to return to your site. By engaging visitors you’ll give them incentive to return, convert, and hopefully invite their network to do the same.